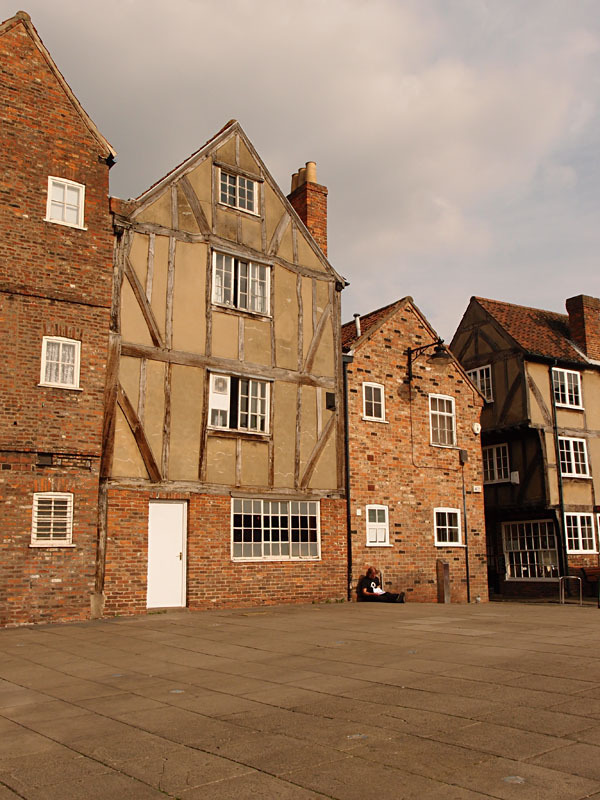 Over the summer and into the autumn we’ve had a fine view of the backs of these buildings, the back of the Shambles, normally partly obscured by market stalls. 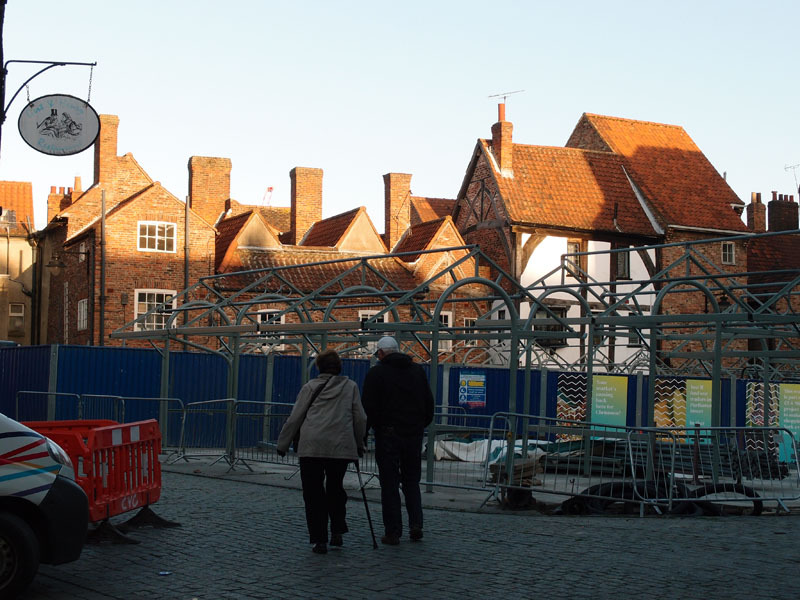 In July I took some photos from the other end of the marketplace, looking towards this end, showing the new views opening up across the area as it was cleared of stalls ready for the refurbishment. Over the summer into the autumn I often walked past and thought how handsome it looked, this space. I’ve often thought that the backs of the Shambles buildings were in many ways more interesting than the much-photographed views down the street from the front. Other people have been admiring too, and I imagine many residents and visitors have taken photos similar to that photo above. 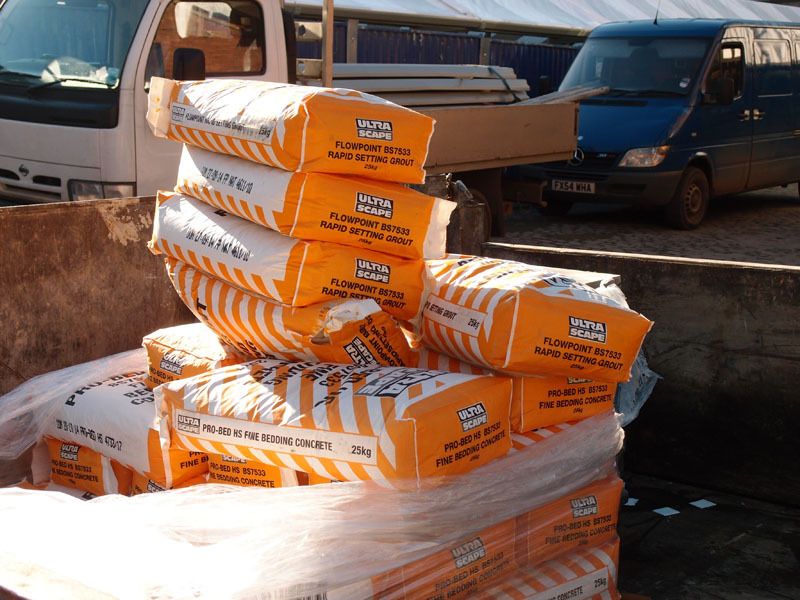 I found this a very pleasing view, if we disregard the construction work clutter. What a great public square this would be, I thought. How nice to emerge from the stubby bit of Jubbergate and see that beautiful collection of buildings glowing in the afternoon sun. It wasn’t like that for long. The new market stalls began to fill the space. Here’s the same view in late October. That’s a shame, I thought. Of course while all this was going on the market stalls usually occupying this space were on Parliament Street for several months. Where they used to be, on a permanent basis, before the market moved in 1964. I don’t have a photo of the stalls here recently, but I do have a couple of photos of Parliament St in its ’empty’ state, taken one evening in June last year. Not exactly gorgeous, is it. Modern shopfronts surrounding a jumble of modern paving with a sad-looking non-working fountain in the middle. This large but not particularly beautiful space is clearly the best place for markets. And of course it’s used for that, in the ordinary course of things, for parts of the year, for the visiting markets. Such as the Christmas one, St Nicholas Fair. 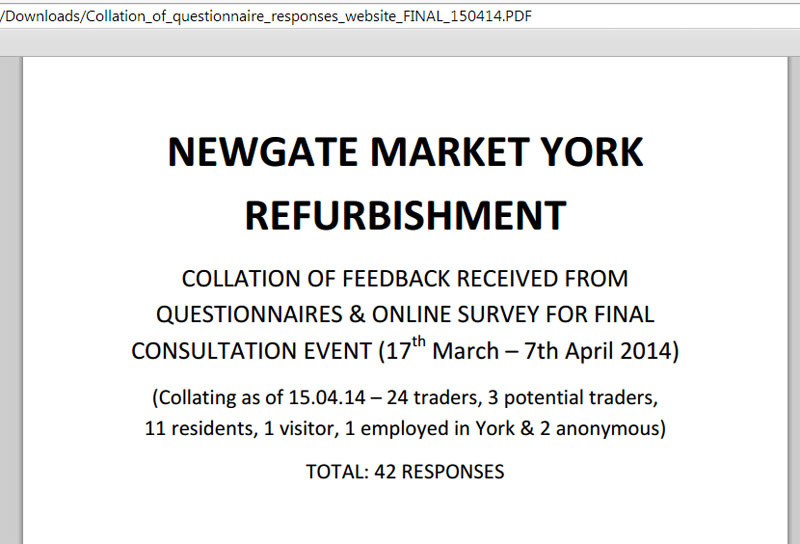 Which is almost upon us, and that’s why the market traders of our regular market are now back in the ‘reinvigorated’ Newgate. This has been renamed Shambles Market. Desperate in the face of the bloomin obvious, which is that returning the daily market to its original/traditional home on Parliament Street for the last few months proved what we all knew already, that’s where it ‘belongs’. Or rather, as I don’t like to claim to speak for everyone, and none of us ever should, it looked to me, personally, and to many others, totally and completely obvious that having the market in Parliament Street on a daily basis like it used to be made absolute sense in all possible ways from all possible angles and that it should stay there all the time. Well, because of the nature of the two places. Parliament Street was created as a marketplace in the 19th century. We’ve messed about with it and used it as a car park and more recently for cycle racks and stuck a toilet block in it (demolished) and a fountain in it (not working) and for some reason planted massive great trees in it, but even after all the stupid clutter we’ve crammed into it we can still see that it’s the best market place. Because it’s wide and long and right in the middle of the main shopping area. It’s really not an attractive street and best covered with market stalls. Preferably permanently. 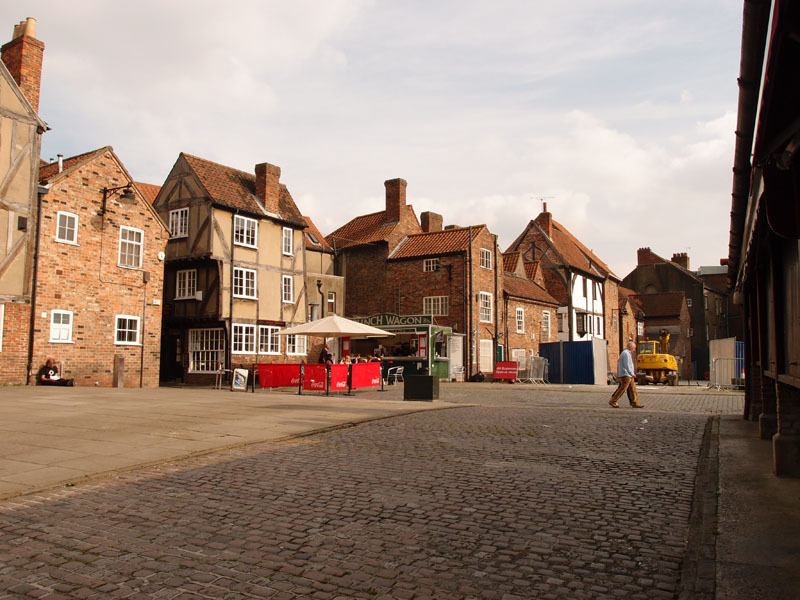 Whereas the area we used to call Newgate Market has some very picturesque views which we’ve now seen revealed after the market stalls were removed. Parliament St has never been picturesque and never will be. It was created for a particular purpose. 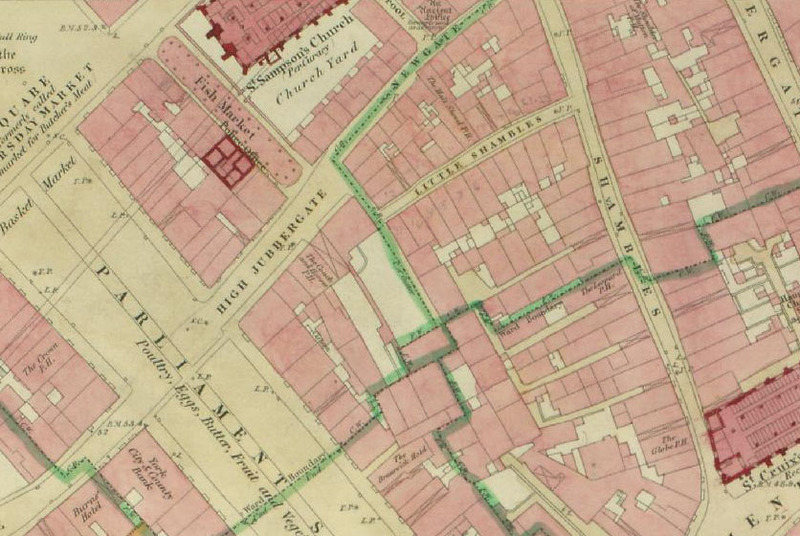 Our 19th century ancestors, in their confident and rather brutal way, cleared a massive space through the medieval streets, creating a huge wide space unlike any other street in the city centre, specifically for the market. It’s worked well as that ever since. Which is why the visiting markets always get to occupy it. We’re messing around with a relatively small area round the corner, fiddling with it trying to make it work as well as Parliament Street did. But it never will, because it’s hidden away, because it’s a square not a long wide space. If the Newgate site housed the visiting (temporary) markets then perhaps the rest of the time (which is most of the time) we could admire and use what would be an excellent open area, a proper city square, with interesting views of a pleasing jumble of buildings. With temporary stalls for the visiting markets filling the space when required. Maybe, if there’s not enough space, they could spill down Jubbergate and onto Parliament Street but still leave half the street for ‘our market’. But no. The daily market has been sent back to a ‘reinvigorated’ Newgate, which means permanent stalls bolted back in to that handsome open space, and a £1.6 million ‘investment’. Not much of this massive investment is visible at present, because the site isn’t properly finished. The Christmas market needing to use Parliament Street means the regular market has to move back into Newgate/Shambles market now, even though they’ll have to move out again, apparently, after Christmas, so the work can be properly completed. In early November the rush was on to get the place to a certain standard. At least they had rapid-setting grout. But still had to work at least one Sunday. I wonder how much that cost us. I’ve not been since the traders moved back in this week but it’s a bit scruffy by all accounts, with bits of tarmac patching, as happened in King’s Square. 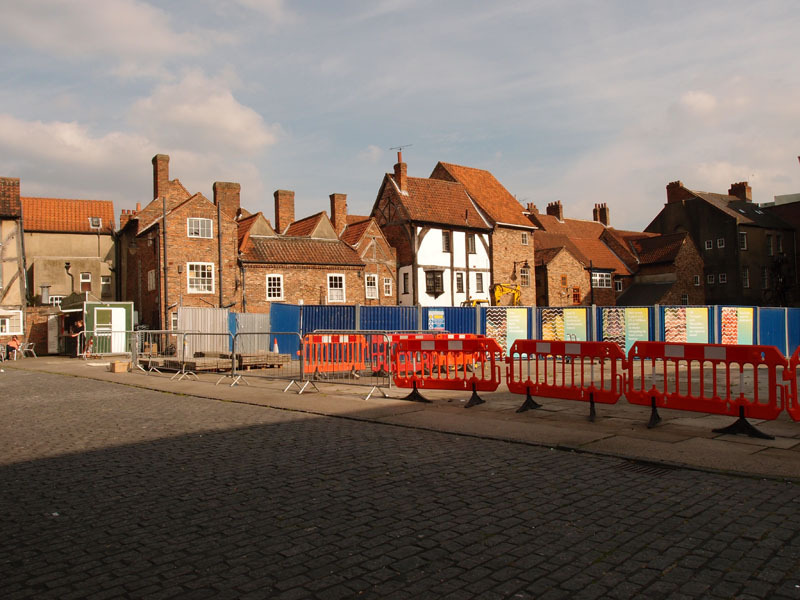 And as in King’s Square when that was newly done, photos I’ve seen online show drifts of gritty mucky mess being trampled all over, residue from the construction work. A bit of a ‘building site’ feel to it, apparently. How many of us care anyway? Much more could be said. There’s a bigger issue here than whether market stalls are a permanent fixture on one area of paving or another. Actually there are several bigger issues. And several smaller ones. Like cracked paving. More later perhaps. For now, this looks like an example of the council ignoring the needs and wants of residents, ignoring concerns and commonsense and pressing on regardless with wasting an awful lot of money on something that isn’t going to work. Reminds me of … well, it reminds me of the Lendal Bridge thing. But I guess because the only people who are going to lose out financially here are the market traders there won’t be the same sense of widespread outrage. 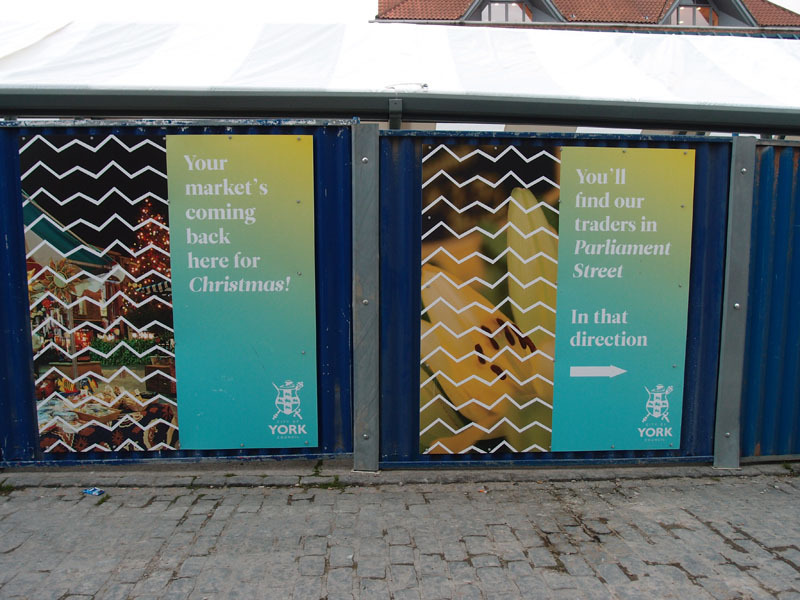 York Mix have covered the market’s reopening and earlier included one of the artist’s impressions of how the new market would look. 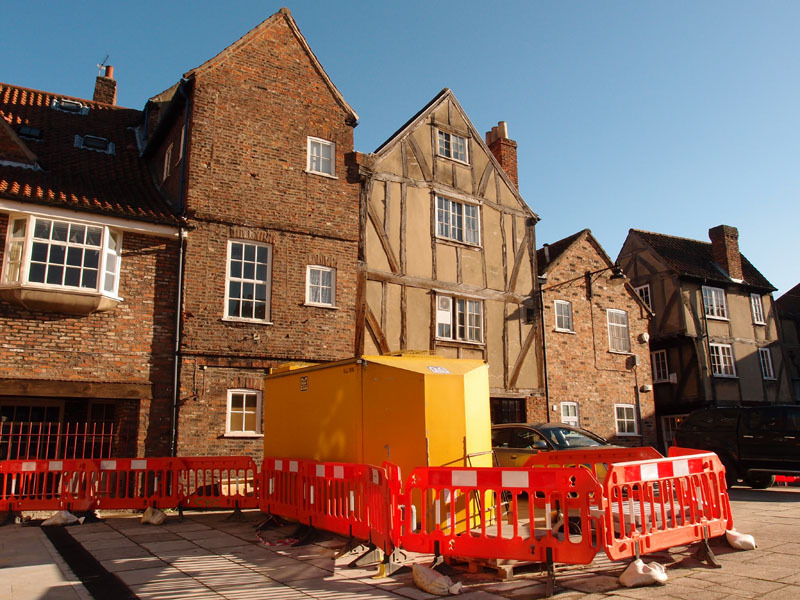 And everyone should listen to Cllr Sonja Crisp, interviewed on BBC Radio York by Nick Morris. About 2 hrs 16 mins into this programme. Move that slider and have a listen. Or perhaps not, if you’re already in a bad mood. Very true! The market worked in Newgate very well for years, but there wasn’t a supermarket on every street corner! plus you could park on market all day long and on main street. Its a proven fact by councils that were markets are returned to high street shop trade go’s up 20% over time. National market federation told CYC this in a interview on Radio York but Jill Cooper seems to know more than the experts! 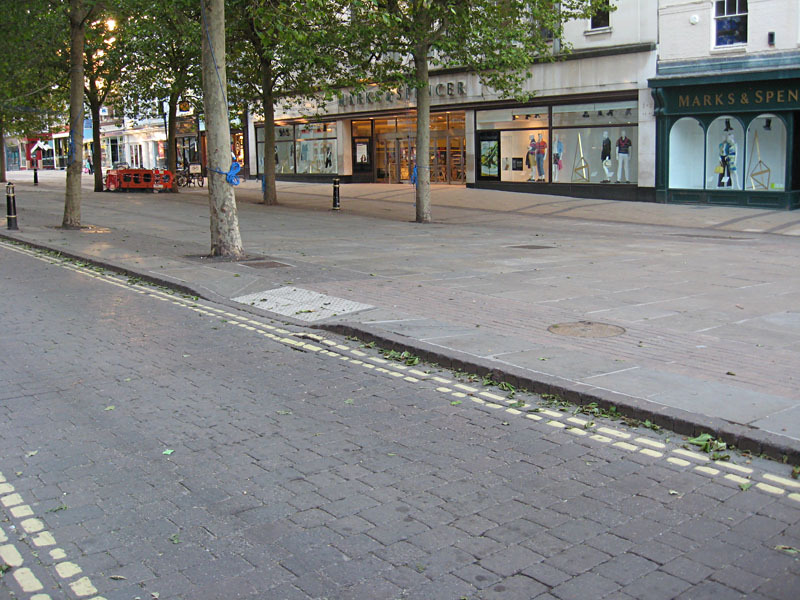 Parliament St after Christmas wants all the trees removing and the fountain, then the refurbished stall need moving in with a gap were fountain is were a couple of trees could be planted and rest for seating for the cafes! 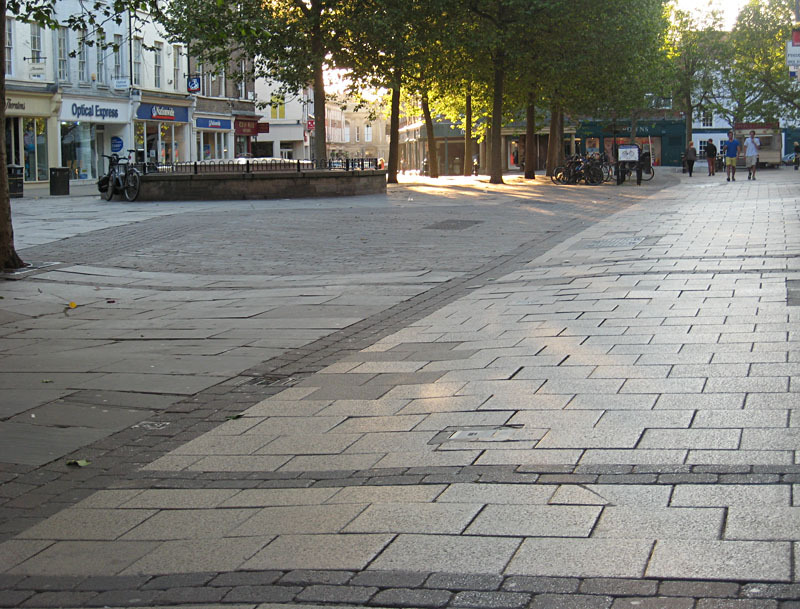 Then lets have Newgate all repaved and used for events etc. Interesting that you mention parking. I’ve seen photos of Parliament Street with cars parked in it. Can’t recall if that went all the way along or was just one end. I wonder if that was the reason the market moved to Newgate in the first place, to make more parking space on Parliament Street. Now of course cars are unwelcome in the city centre. Things have certainly changed a lot in the last 50 years, in so many ways.